The Ruth and Paul Manz organ was designed to suit the Augustana Chapel space, daily worship, and a range of liturgical and secular organ music. As a unique influence behind the modern revival of the hymn festival, Paul has stirred the lives of thousands across the Church. He and his wife, Ruth, have selflessly offered their gifts to call forth both joyful support and cheerful generosity from those committed to the missions of Christ Seminary-Seminex and the Lutheran School of Theology at Chicago. Ruth and Paul are honored as gracious, loving and caring contributors to this community for whom its members past and present offer thanks to almighty God—Source of all life, Word of salvation, and Spirit of mercy. The 2 manual, 31 rank, 2-story pipe organ is Opus 31 of M.L. Bigelow & Company, Inc., Organ Builders of American Fork, Utah. It was installed over two and a half weeks by four crew members from M.L. Bigelow & Company. It is the second-largest organ to date built by the company and is the only Bigelow organ in the Chicago area. “The Church's One Foundation" was the first hymn played on the instrument after its completion. Daniel Schwandt, 1997 winner of the Manz Organ Scholarship and LSTC staff musician at the time, was organist for the dedication service. A hymn festival with Lorraine Brugh, Kruse Organ fellow and Valparaiso University organist, and a recital by renowned keyboardist David Schrader rounded out the dedication weekend. From September through May, LSTC hosts a free monthly lunchtime (12:15 p.m.) series of organ recitals known as the Manz Organ Series. These 30-45 minute recitals feature respected organists in the Chicago area. 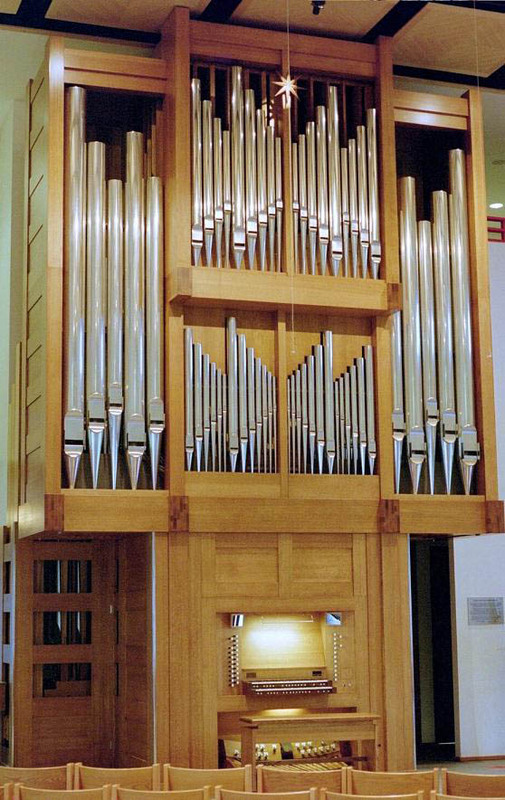 Since 2007, the recitals have shown the range and versatility of the Ruth and Paul Manz Organ. Organ students are encouraged to apply for the Ruth and Paul Manz Organ Scholarship. This scholarship was established by Mount Olive Lutheran Church, Minneapolis, to honor the contributions of both Paul and Ruth Manz to the congregation over the 37 years of their service there. This annual scholarship is a testimony to their witness to Jesus Christ through the ministry of music and other expressions of the church. The $3,000 scholarship is intended to be an encouragement to organ students who are preparing for careers as church musicians. Please include information about the organ played for the recording (builder, date, number of ranks) and the place of the recording. The Hymn requirement “Laudes Domini” ELW #853. Utilizing the competition specified hymn tune, improvise a suitable introduction (in the manner of a chorale-prelude or meditation) and follow with a full performance of an unaltered verse, plus an original altered-harmonization setting of the hymn tune, keeping in mind the text/character of the hymn. The audio CD used must be of the highest quality designed for recording music and must contain an unedited 'take' of each of the individual segments listed above. All materials must be postmarked no later than July 1, 2019. Make gifts to fund this scholarship directly online. In the Gift Purpose section at the bottom of the form, please enter the purpose of your gift to be "Ruth and Paul Manz Scholarship Fund."